NASA/Joel KowskyA Russian Soyuz rocket launch. NASA, already in a serious financial pickle with the Russians, may soon look to Boeing for help. When the space agency retired its last space shuttle in July 2011, it expected commercial carriers like SpaceX and Boeing to launch its astronauts into space by 2015. But both SpaceX and Boeing hit snags with the development of their rockets and spaceships, slipping that schedule by at least 3 years, according to a September 2016 audit by NASA’s Office of Inspector General (OIG). This left NASA with one option for getting astronauts to and from the International Space Station (ISS) through 2018: a Russian spacecraft called the Soyuz. 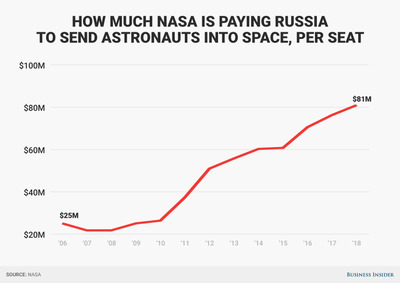 Russia has taken full advantage of its temporary monopoly by charging NASA ever-more-exorbitant sums for those Soyuz seats — yet the problem for NASA might soon get worse. As Eric Berger reported at Ars Technica, NASA issued a new solicitation on January 17 to buy two more Soyuz seats from Boeing, plus “an option to acquire crew transportation from Boeing for three crewmembers on the Soyuz in 2019.” In other words: NASA may end up buying five tickets aboard the Soyuz from Boeing. If that sounds a little convoluted, particularly since Boeing’s spacecraft development delays helped drive NASA to this conundrum in the first place, welcome to the current state of human spaceflight. As Berger notes at Ars Technica, RSC Energia — the Russian entity that makes and launches Soyuz rockets and spacecraft — recently settled a $320 million lawsuit with Boeing. Part of Boeing’s settlement package includes five Soyuz seats and, according to NASA’s recent solicitation, one is scheduled for 2017, another for 2018, and three for 2019. NASA wants those tickets to ensure it’s making good on its roughly $75 billion investment in the ISS, set to disband in 2024, by filling it up with as many crewmembers as possible. 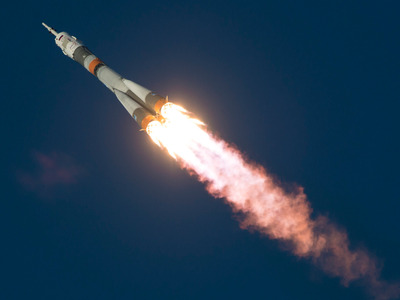 What might NASA pay Boeing for each of its Soyuz tickets? A NASA representative declined to provide Business Insider with an estimate, but noted “prices will be finalised during contract negotiations” and that the space agency “will ensure it receives a fair and reasonable price for the transportation services from Boeing before a contract is awarded.” Representatives from Boeing acknowledged an emailed query from Business Insider, but did not immediately provide an answer. If precedent is any guide, however, Boeing’s Soyuz seats could cost NASA dearly. 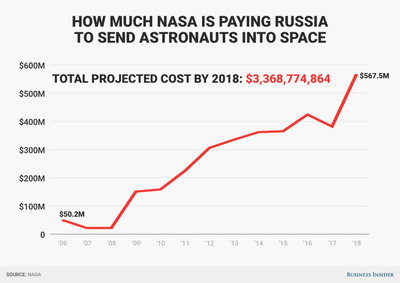 Skye Gould/Business InsiderHow much NASA is paying Russia for each US astronaut seat aboard a Soyuz spacecraft from 2006 through 2018. That’s according to NASA OIG’s September 2016 audit data. 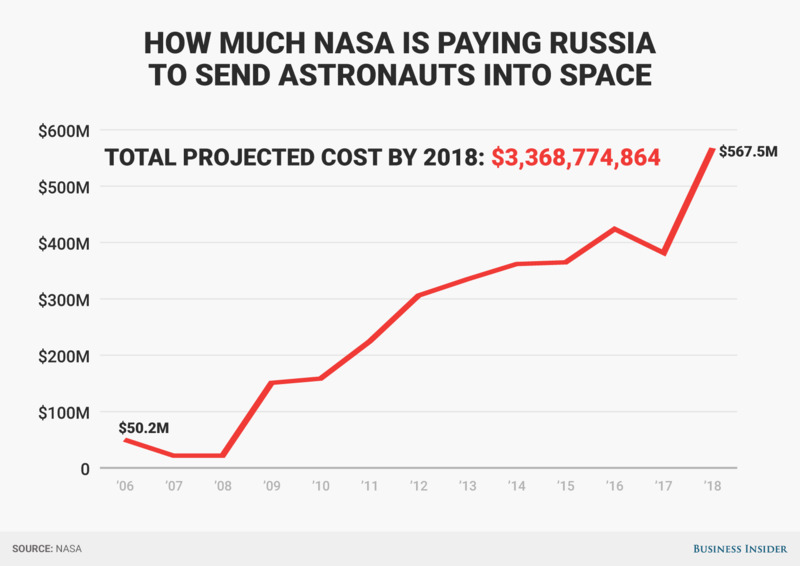 The chart below, also based on the report, factors in the price of a seat and the number of astronauts that NASA plans to launch (about six per year) to show how much NASA has paid Russia and could end up paying for Soyuz seats. The total cost over 12 years is more than $3.36 billion — and that’s not including the possible purchase of Boeing’s three Soyuz seats for 2019. 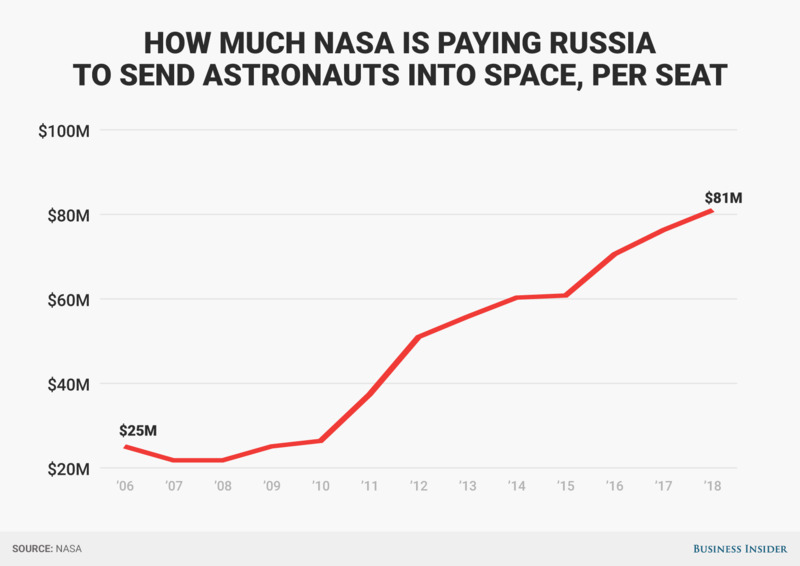 Skye Gould/Business InsiderHow much NASA will pay Russia to send US astronauts into space from 2006 through 2018. A presentation given by a NASA official in May 2016 estimates the cost of each seat aboard SpaceX’s Dragon spacecraft and Boeing’s CST-100 Starliner spacecraft will be $58 million. The Sept. 2016 audit made clear that any other hiccups in the NASA’s commercial crew program, which could earn Boeing and SpaceX up to $4.2 billion and $2.6 billion (respectively) for their services, will be costly. Indeed, that looks to be the way things are headed now.